One of the photos in the Society collection is reference NL 1591 and shows two RODs back to back without tenders. 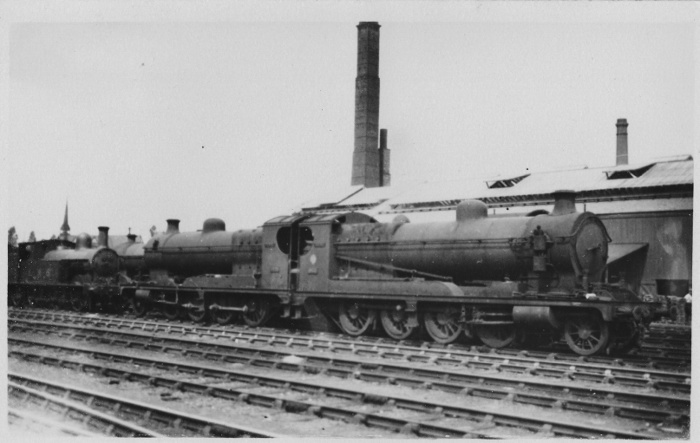 I know the LMS bought several that were never put into traffic but were really bought for their tenders but I would like to know if that is what the photo shows. Unfortunately it is not a very clear picture but I hope by putting it up as a mystery photo somebody may be able to confirm where it was taken (Crewe?) and even what were the engine identities. So where and any other information you can give about the engines and surroundings. I'm almost certain that this is Crewe works. The spire above the cab of the tank engine fits with St Barnabas' Church on West Street and the building immediately behind the locos is what was in the 1970s the works maintenance and bogie repair shop.